The string I got was great but was shocked at the shipping costs. I got this as a low G string for my concert ukulele on recommendation from a ukulele website and I couldn’t be happier!! Great sound and feel and look! Was looking for a workable low G non-wound option after many ‘short-lived’ red string trials. 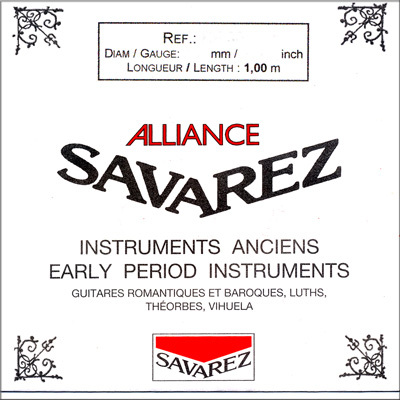 The Savarez KF 95A give you three (3) lengths of great non-wound linear G strings for tenor siZed uke! SBM delivered them quickly with quality product you can always count on! Q: I'm looking for a low G string for my ukulele... will this work? If you have a tenor/concert, La Bella uses a polished phosphor 030 gauge low G.
If you prefer the silver wound Savarez, the KF77 is a .0303. Keep in mind the Savarez KF singles that end in "A" are 2 meters long, the ones that don't end in "A" are 1 meter.